His high school classmates used called him “piglet,” saying he was too small and athletically challenged. That blatant disrespect drove Andrew to gain 40 pounds of muscle and shut mouths! Starting my freshman year in high school, I noticed how small I was compared to everyone else. I was always the kid in the group who got picked on and was given the nickname "piglet." I always wanted the respect I never got. I noticed the athletic kids got the most respect. I didn't have time for sports when I was in high school because I was always working. Growing up, I loved being active. I got into skateboarding during middle school and my early high school years. As the year went on, I decided to sign up for a weight training class at school. I began enjoying the feeling of pushing myself everyday and exercising in general. I got a natural high from the gym, an adrenaline rush that I became obsessed with. From there, my transformation began. I took a weight training class at first to get the basics down. After that, my friend and I began hitting a local gym. We both wanted to get Yok3d. At first, we were hitting the gym way more than we should have; overtraining and eating all types of crap. 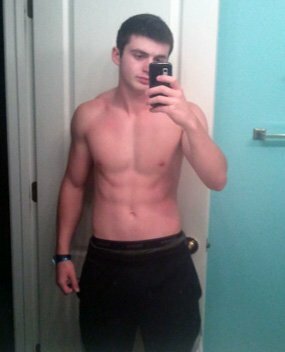 Over the years I found what works for me, what to eat, and especially what not to eat. Diet is a huge aspect overlooked by the average lifter. Everybody is looking for the next big supplement. It's all about the basics. Exercise and diet are what I concentrate on; supplements are secondary. That's what worked for me. I like to train heavy and superset as much as possible to get a maximum pump. I like to get in and out of the gym as fast as possible. I usually train two muscle groups per day with higher volume and very high intensity. I would have to say the diet by far. Packing food has always been a challenge for me. Hitting my ideal amount of macros while keeping my food as clean as possible poses many challenges, too. You are what you eat. I plan to do as much as I can in the fitness industry. I'm not really thinking about a career per say. 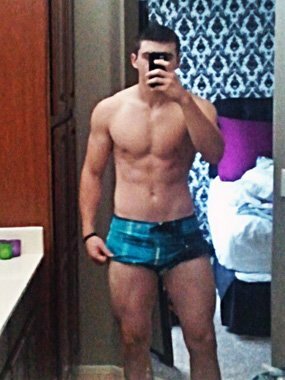 I'd love to compete in men's physique in the future, become a trainer as a side job, learn as much as I can about nutrition, and get hooked up with supplement companies. At times, you'll want to quit or turn to illegal substances to help further your progress. if you plateau. It happens to everyone. Switch up your workouts and make adjustments to your diet. The articles always help me to get going in the right direction as a beginner. I still love to read them as an advanced bodybuilder. I get all my supplements from Bodybuilding.com because they have the best prices.